Mayor Rahm Emanuel announces the completion of a draft consent decree for reform of the Chicago Police Department alongside Chicago Police Supt. Eddie Johnson and Illinois State Attorney General Lisa Madigan on July 27, 2018. Editor’s note: Updated on Oct. 23, 2018 with the finalists selected by the attorney general and the city. 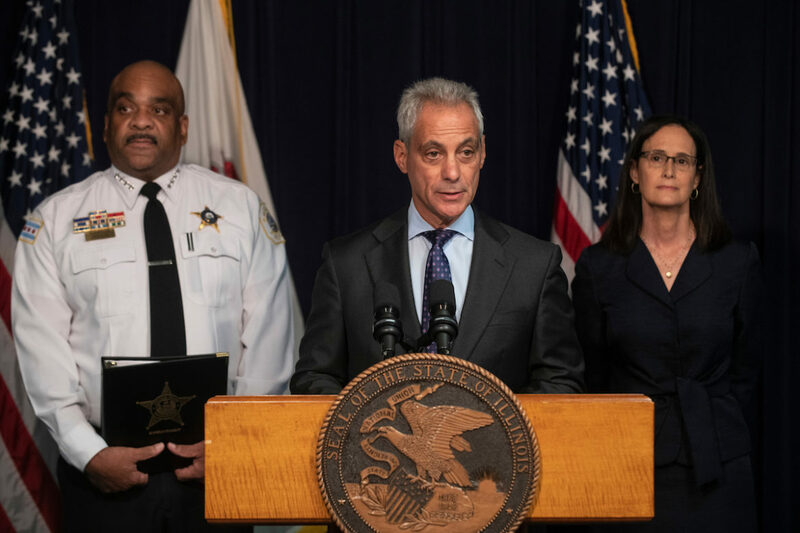 On Thursday, Illinois Attorney General Lisa Madigan and Mayor Rahm Emanuel filed a proposed consent decree for the Chicago Police Department in federal court. Absent any major changes from Judge Robert M. Dow, Jr., who still has to approve the proposal, this 227-page document will chart the course for CPD reforms for years to come. Neither Madigan nor Emanuel are running for re-election, so they both will be out of office by the time most of the consent decree’s mandates take effect. As with most cities, Chicago will be placed under the authority of an independent monitoring team to ensure the city makes the changes required under the consent decree. Nine teams responded to a request for proposals to become CPD’s independent monitor. Most of the teams are led by attorneys—including former federal prosecutors, former judges, and a former mayor. Many of them include retired police executives as full team members or subject matter experts. Three of the nine lead monitors are based in Chicago, but the others are spread across the country, from Oakland to Cleveland to New York. Over the past two decades, as the number of police consent decrees has increased, a cottage industry has cropped up to serve as monitors. Some of the teams that applied to be Chicago’s monitor include well-known players in this field. Others are relatively new. All teams have experience conducting government or corporate audits. Monitoring a detailed, years-long consent decree is a complex undertaking, overseeing one of the city’s most powerful bureaucracies. It is also expensive. The city and AG have set $2.85 million as the annual cap for monitoring costs, but some of the bids came in higher. Hourly rates for the lead monitor in the proposals range from $225 to $780, though most teams have a stepped fee structure, which sets lower fees for other team members. Experience: Coar was a federal judge in Chicago for 24 years, and oversaw the consent decree over the redevelopment of the Cabrini-Green public housing project. He was also the arbitrator that reviewed disputed claims under Chicago’s reparations ordinance for victims of police torture. Cramer led the prosecution of Cmdr. Jon Burge on obstruction of justice and perjury in connection with the decades-long torture of black suspects in CPD custody. You should know: Hillard Heintze is a law-enforcement and risk management consulting company co-founded by Terry Hillard, superintendent of CPD from 1998 to 2003, and again for two months in 2011. The proposal states that Hillard’s association with the firm ended in 2009. Experience: The team from law-firm BakerHostetler, which also has a Chicago office, has served as monitor for Merrill Lynch, the Bank of New York, and other companies. Carole Rendon was the U.S. Attorney during the negotiation of the consent decree between the Cleveland Police Department and the DOJ. You should know: The proposal promises that at least one member of the monitoring team’s leadership team will be based in the firm’s Chicago office at all times. Experience: Combined, the team has dozens of years of experience in law enforcement, many of them as top officials and administrators. They have conducted internal and external assessments of police-involved shootings in Minneapolis and St. Louis County. Two fellows of the Police Foundation, Daniel Ison and Darrel Stephens, who are both also members of the monitoring team, conducted surveys and focus groups of CPD officers as part of the consent decree drafting process. You should know: The Police Foundation is an independent, non-profit organization that conducts research and policy related to law enforcement and public safety. Many of its staff and fellows, like the members of the monitoring team, are former law enforcement officers and administrators. Experience: Hickey was selected earlier this year to lead a review of Chicago Public Schools policies and procedures, after the Chicago Tribune found a pattern of sexual abuse cases, and also conducted an investigation into sexual harassment claims in Illinois House Speaker Michael Madigan’s office. Coldren was the federal monitor over the Cook County Department of Corrections for four years, and he has conducted technical assistance for police departments across the country for several DOJ policing initiatives. You should know: The monitoring team also includes Dennis Rosenbaum, a professor emeritus at UIC who has conducted many research projects on CPD, including evaluations of the CAPS program, CPD’s first hot spot policing initiative, and the body-worn camera program, some of them paid for by the department. Experience: Lemire has served as an internal monitor for several New York City agencies. Long is a member of the monitoring team for the NYPD and oversaw the NYPD training academy for three years. You should know: StoneTurn is a compliance, auditing and investigations firm with offices across the country, including in Chicago. Experience: Frenkel has extensive experience as a corporate independent monitor and the team includes six former federal prosecutors. You should know: Dennis Archer was a justice on the Michigan Supreme Court and, after his time as mayor of Detroit, went on to become the first African-American president of the American Bar Association. Obama confidant David Axelrod was Archer’s campaign manager in both his mayoral campaigns. Experience: Muhammad is currently a federal monitor in two separate cases in Illinois, one overseeing reforms to the juvenile parole system and another overseeing reforms to the adult parole system. Wolf is the lead monitor in the settlement agreement between the DOJ and Los Angeles County Sheriff’s Department, overseeing a team on which Muhammad also serves. You should know: This team also includes Christopher Mallette, a lifelong Chicagoan who has served in several positions within city hall, including as director of community safety initiatives under Mayor Richard M. Daley and assistant commissioner of the Department of Family and Support Services. Most recently Mallette worked in collaboration with CPD and other state and local agencies as executive director of the Chicago Violence Reduction Strategy. Experience: The lead members of this team have significant experience as internal and external monitors of the Los Angeles Police Department, the LA County Sheriff’s Department, the Portland Police Bureau, the Palo Alto (CA) Police Department, and others. You should know: OIR is a significant player in the police oversight field. One of the team’s advisors, Merrick Bobb, was the first long-term, independent monitor of a law enforcement agency, overseeing the Los Angeles County Sheriff’s Department for nearly 22 years. A subject-matter expert, Samuel Walker, is perhaps the leading academic voice on police accountability and early intervention systems. Experience: This team is a collaboration between several large corporate firms: Quinn Emanuel Urqhart & Sullivan, a Los Angeles-based law firm with a growing office in Chicago; BDO USA, an accounting firm based in Chicago, and Mitchell Titus, the largest minority-owned accounting firm in the U.S. The members mostly have experience in corporate audits and investigations. You should know: As an assistant U.S. Attorney, Bunge led the prosecution of the Ford Heights chief of police and six police officers on racketeering and bribery charges. Bunge was a finalist for the job of top federal prosecutor in Chicago in 2012, when Patrick Fitzgerald stepped down. Quinn Emanuel represents various Chicago employee pension funds, including the Policemen’s Annuity & Benefit Fund of Chicago, in an antitrust case. And Mitchell Titus is the auditor for the police pension fund. Under the proposed consent decree, a joint “evaluation committee,” made up of officials from both the Attorney General’s office and the city, will review the applications and accept public comment before choosing an unspecified number of finalists. Both sides will interview the finalists and there will be a public forum, where community members can ask questions of the finalists. Together, the AG’s office and the city will pick a monitor—or, if they can’t agree, each side will submit a name and the judge will decide.